RESIDENTS whose efforts have made a difference to the city were honoured at the Citizen of the Year Awards, held at Kingston Council’s annual Australia Day Breakfast on Monday at City Hall. The four awards include Citizen of the Year, Young Citizen of the Year, Community Group of the Year and Young Community Group of the Year. Presenting the awards, mayor Geoff Gledhill said each of the award winners had tirelessly served the Kingston community. “Thanks to their efforts our community is more connected and supportive and we thank them and commend them for their good work,” he said. For 20 years, Charlie Mizzi, 68, of Clarinda, has inspired others in the community with his leadership and energy through a wide range of community groups. His tireless efforts and dedication have helped support families with sick children, made the community safer, developed local parks and given the local community a voice. 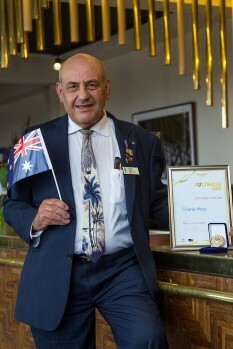 “Charlie Mizzi epitomises the selfless attitude of so many of our active community volunteers. He does a fabulous job year in, year out and is actively involved in a number of community groups in Kingston, and in the wider community,” the mayor said. There was no time yesterday to celebrate his award. Mr Mizzi, who settled in Kingston after coming from Malta in 1968 aged 21, was ready for ‘work’ at Ronald McDonald House, helping families with children being treated at Monash Children’s Hospital. 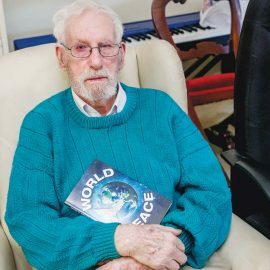 He and Gael, his wife of 45 years, are long time helpers there – one of many vital community organisations which simply could not operate without people like him. Mr Mizzi’s voluntary work includes helping on the Ronald McDonald House committee for 21 years, sitting on the Oakleigh and Clarinda Village committee (20 years), membership of Neighbourhood Watch (20 years), helping with parks maintenance, strengthening Clayton and Clarinda committees, senior citizens and Avicultural Society of Australia (40 years). “Being named Citizen of the Year is a fantastic award – and I earned it, too,” he quipped. Carrie Ewin, 24, of Chelsea Heights, has helped hundreds of local seniors learn valuable computer skills through local community centres. She was the driving force behind Longbeach Place securing one of four Victorian Government grants to deliver a digital literacy project for seniors. “I am very excited to receive the award,” she said. “The students – many in their seventies – give me a lot more than I give them. 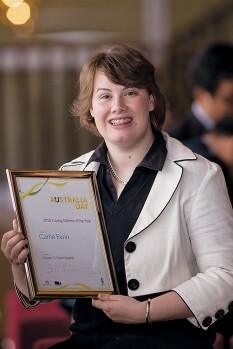 Carrie has been involved with Longbeach Place since 2008 as a student, volunteer, tutor and facilitator. She is also a volunteer leader at the Chelsea PC Support Group, assists at the Cheltenham Community Centre’s computer classes for people with acquired brain injury, and has served as secretary of the Godfrey Street Community House. “It’s wonderful that such an impressive young person dedicates so much of her spare time to helping seniors in our community become more connected to the digital world,” the mayor said. Over the past 25 years the Friends of Braeside Park group has successfully reclaimed and revegetated a former quarry, equestrian centre and sewerage farm on the Lower Dandenong Rd and transformed it into native heathland and wetlands. In that time, the number of park rangers has been cut from 15 to four – with the Friends of Braeside Park group helping fill this gap. The group’s work includes park planning and development, tree planting, seed collection and plant propagation, bird counting, salinity monitoring, water quality testing and monitoring bats and possums. 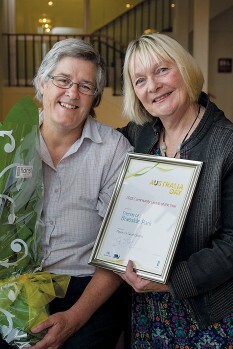 Margaret Hunter, of Friends of Braeside Park, said volunteers were thrilled with the award. “We’ve been established 25 years and this will give us lots of assistance in attracting new members and promoting the work of the group,” she said. Cr Gledhill said this dedicated volunteer group had given up their time and hard work over many years to preserve and enhance this vital environmental and ecological part of Kingston.